Art, culture, and creativity are powerful drivers for inclusive and equitable artist-led community development. 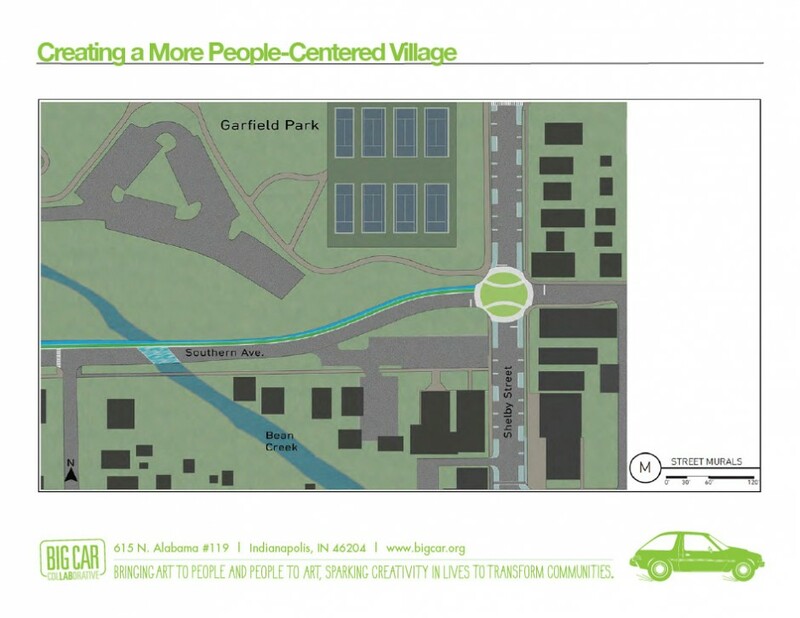 As part of Big Car’s ongoing work in the Garfield Park neighborhood south of Downtown, our team works closely with the South Indianapolis Quality of Life Plan, Garfield Park Neighbors Association, and residents of all backgrounds to help revitalize this area along the Shelby Street corridor between bustling Fountain Square and the University of Indianapolis. 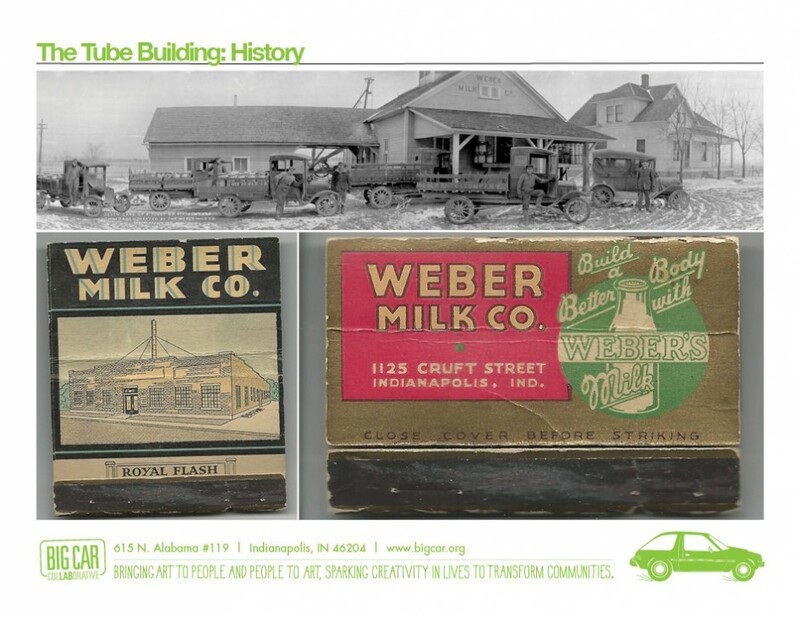 Watch our short video about the project and read this March, 2016 story by the Indianapolis Business Journal that summarizes our work. 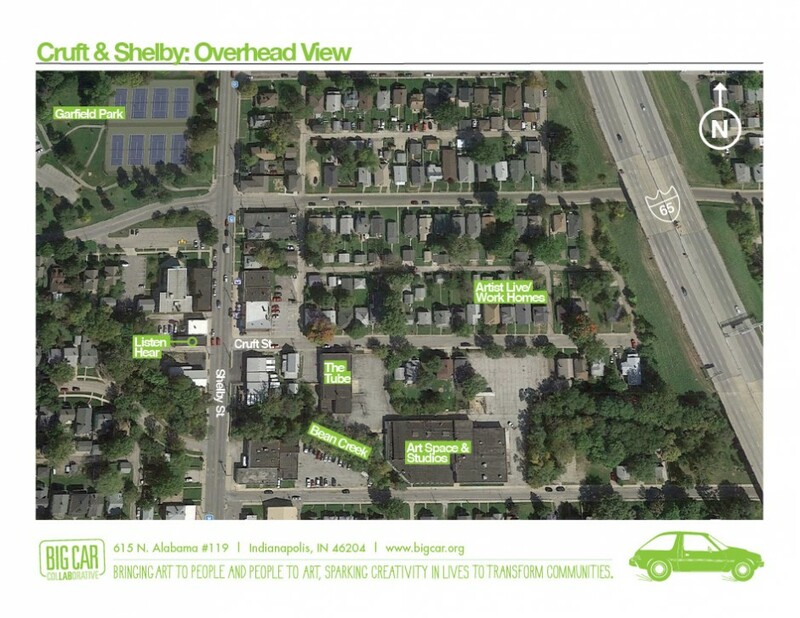 The Garfield Park area includes a combination of the city’s oldest park and a mixture of stable blocks of mixed-income homes and other blocks – divided from the park by busy Shelby Street – that struggle with crime, vacancy, blight, and issues related to poverty. 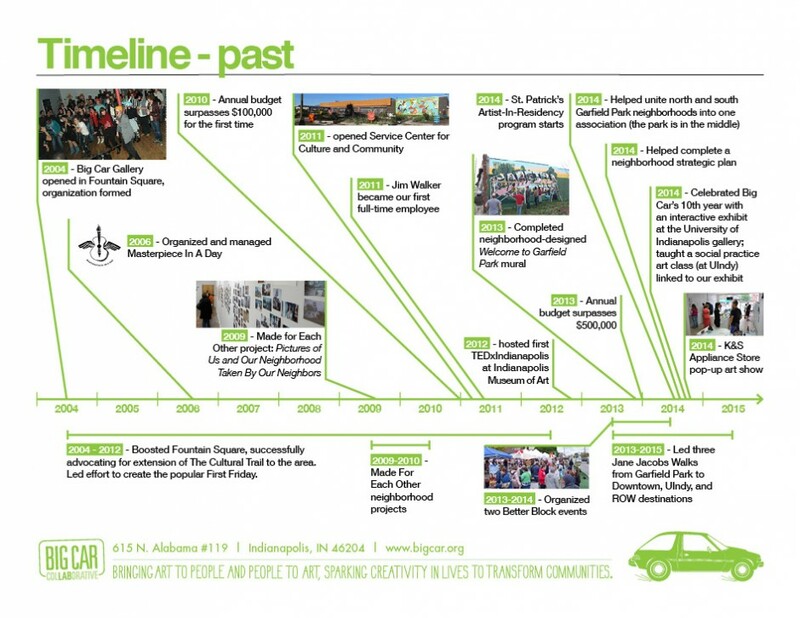 With most of Big Car’s staff artists living and working in the southeast area, we’re dedicated as neighbors to helping improve the quality of life for all people in this often-overlooked part of the city that also suffered from I-65 slicing through it in the early 1970s. 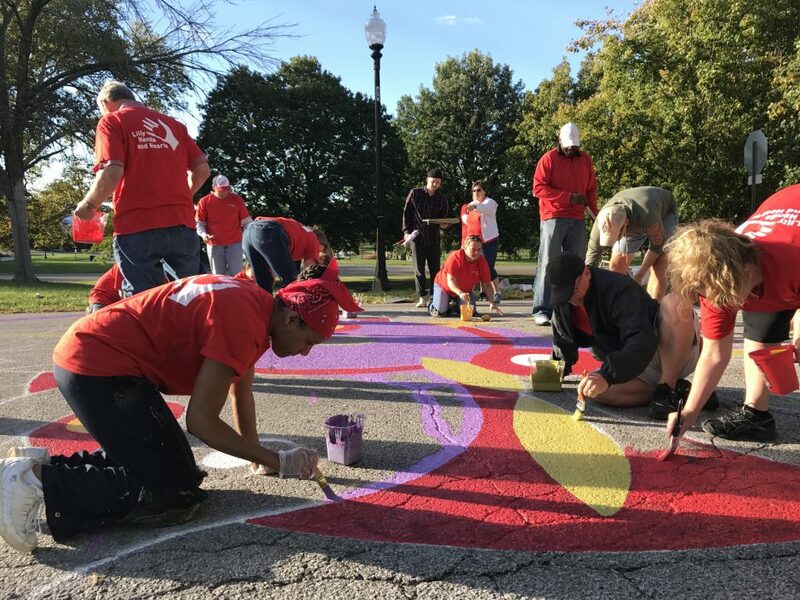 We began working in the Garfield Park neighborhood in 2012 with projects like Better Blocks, Good Vibrations, Jane Jacobs Walks, and Welcome to Garfield Park collaborative mural. The neighborhood enjoys a higher quality of life, is safer, few buildings sit vacant, people of all backgrounds feel better connected to this place and their neighbors (both physically and socially), and children and adults enjoy more opportunities to succeed. 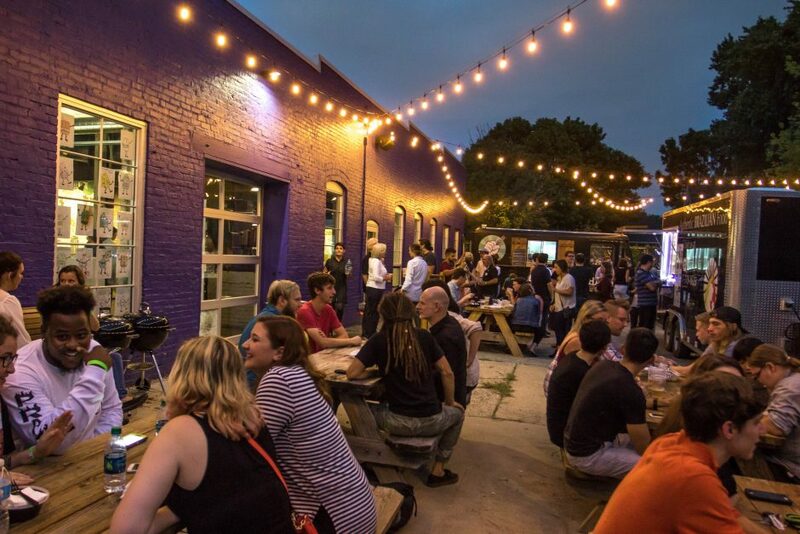 The neighborhood is a walkable village (also easily accessible by mass transit) where small businesses thrive, employ and serve neighbors, and draw customers from all over the city. 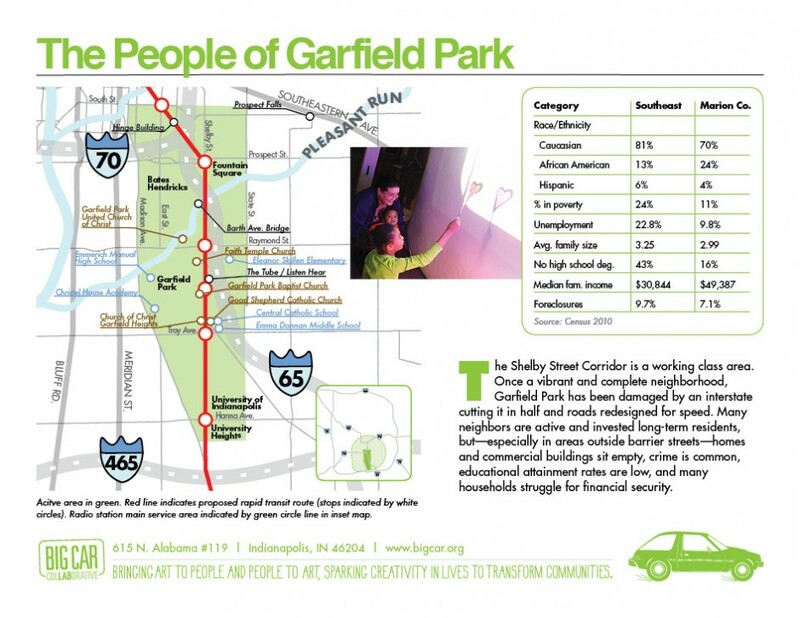 People outside of the Garfield Park neighborhood have more positive attitudes about this area and neighbors on all blocks (both east and west of Shelby Street) enjoy an elevated level of pride and involvement. Art and creativity are integral to the culture of the Garfield Park community and artists view the neighborhood as their long-term home. Plus, residents feel positive about artists in the community. 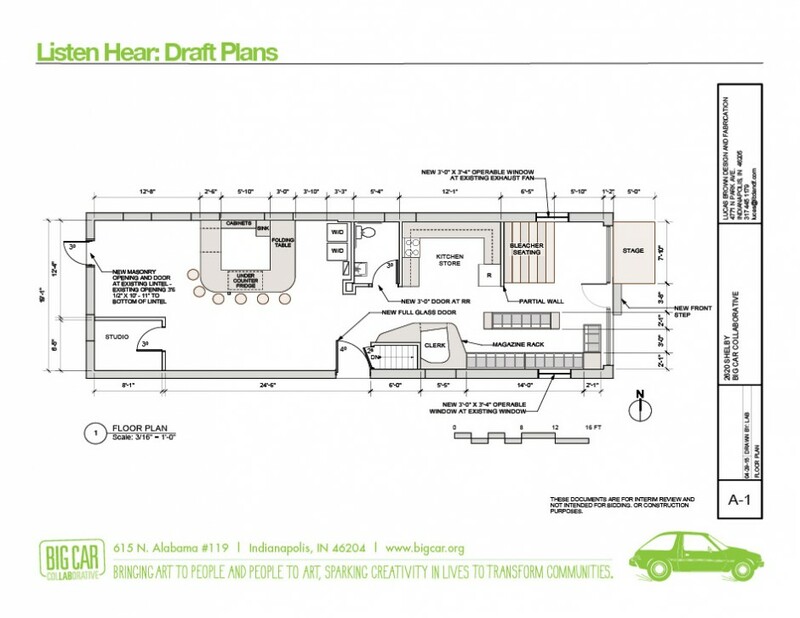 To do this, we’re taking a four-prong approach: Opening a large community art space in a neighborhood, a sound art space with a community radio station on the Shelby Street commercial corridor, affordable artist housing, and advocacy for a safer and more walkable village. 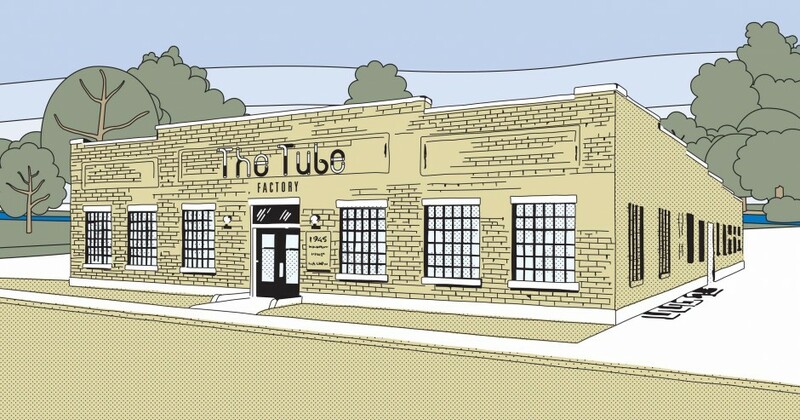 So far, we have purchased and renovated a 12,000-square-foot manufacturing building called Tube Factory artspace as the anchor for our work. 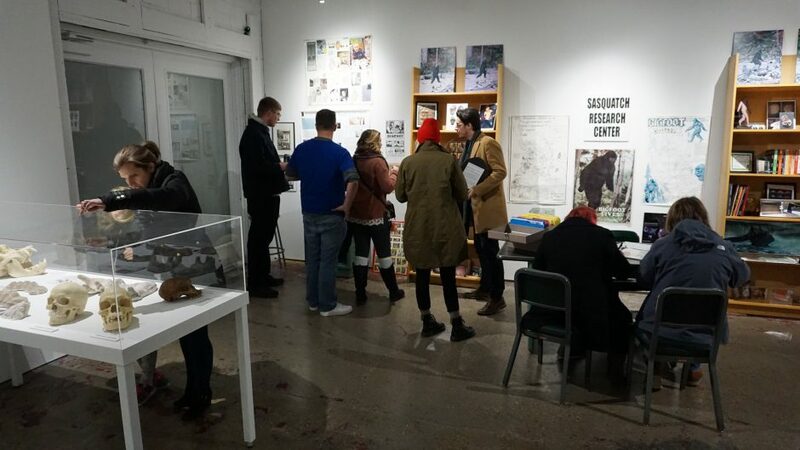 This previously vacant facility built for use by a dairy in 1908 is a workshop and hub for our citywide placemaking work, a socially engaged art lab, and a space for contemporary exhibitions from local and national artists focused on place, and a large room for community meetings and cultural events. It opened in May of 2016. 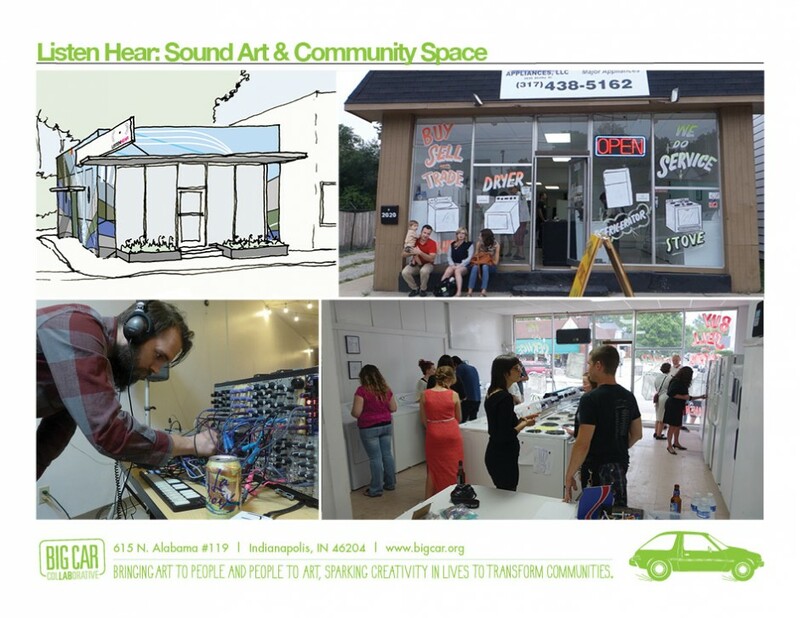 Additionally, we have fixed up a storefront building on nearby Shelby Street to house Listen Hear, a sound art space with a community radio station (WQRT 99.1), gallery, and listening room. This space, previously located on the west side, moved to Garfield Park and opened in April of 2016. 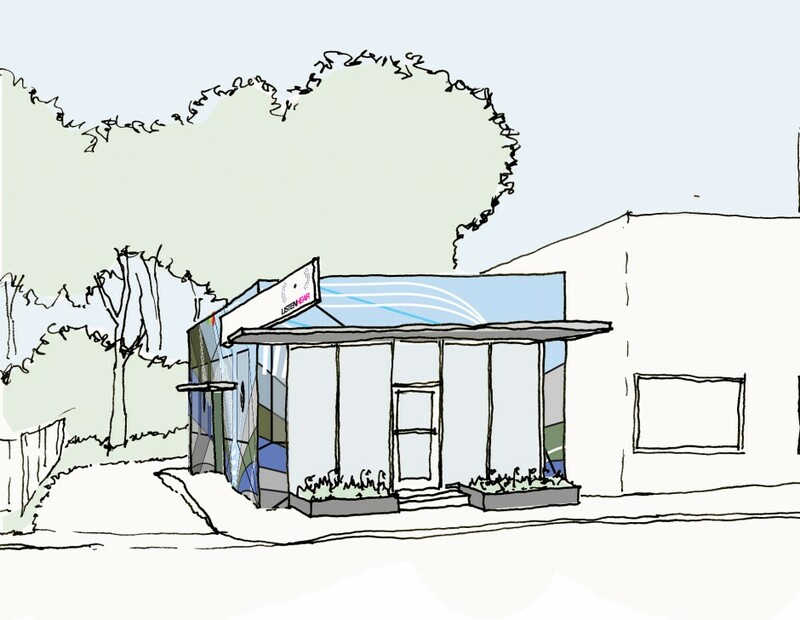 Big Car and Riley Area Development Corporation – inspired, in part, by Project ROW Houses in Houston – are also transforming empty houses surrounding The Tube, which will turn into affordable living-working homes for artists. 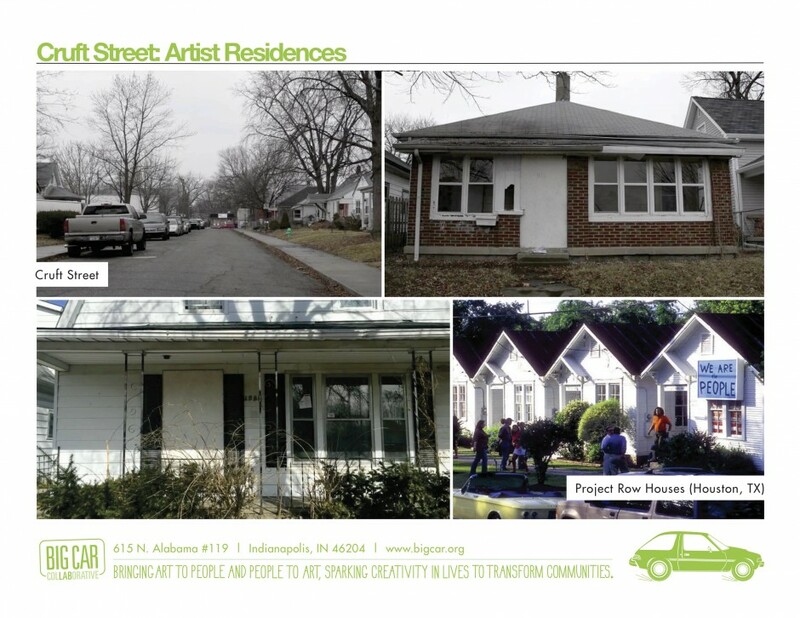 Boarded up homes will soon become an asset to the neighborhood with involved artists supporting the community and helping make a difference. 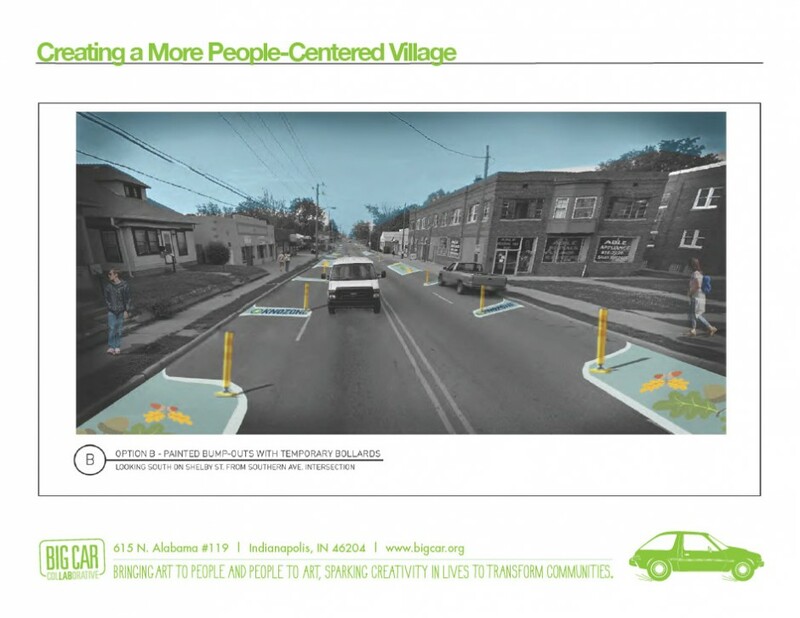 We are working hard in partnership with the City of Indianapolis and neighborhood groups to work in hands-on ways and advocate for a safer, more walkable, and connected neighborhood for all. Read the full story of the project with many comments from partners in our press release. 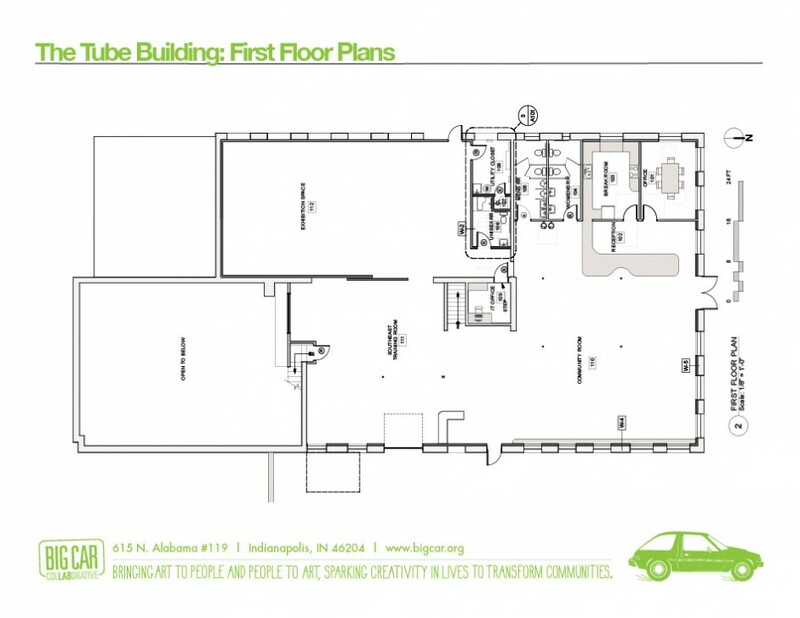 And view and download our information packet with images on the project here. Check out additional excellent coverage of the project in The Indianapolis Star, Indianapolis Business Journal, NUVO Newsweekly, on WRTV6, in the Southside Times, in No Mean City and in The Urban Times. 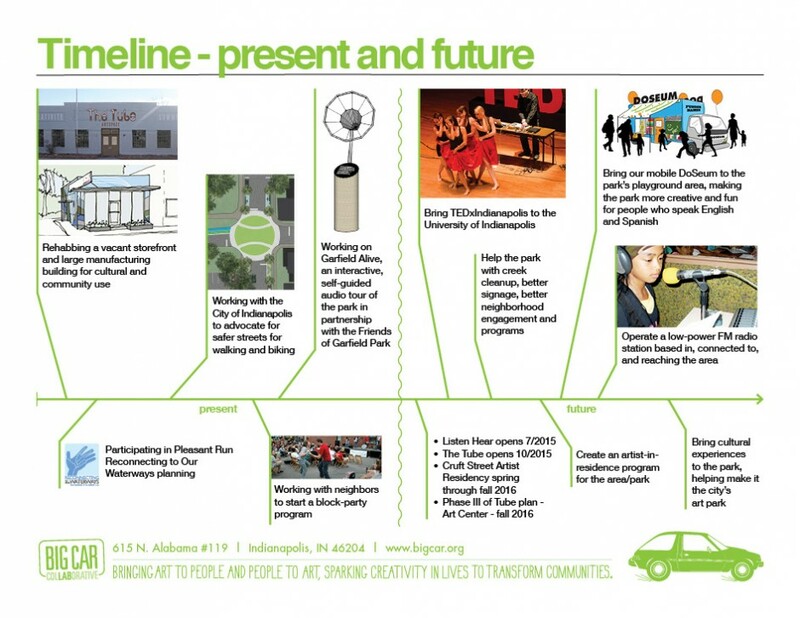 In order to make this project transformational for the neighborhood and help the city as a whole, we continue to raise funds to support these projects and our placemaking work in other neighborhoods and areas of the city. People interested in donating can do so here. 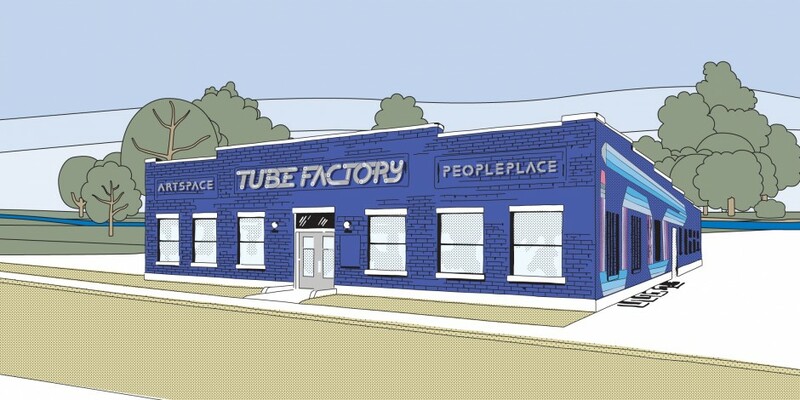 The Tube Factory toolshop has received a minor revamp by staff artist and builder, Elliot Thornton. Shop Classes and Volunteer Days are back starting in February 2019. 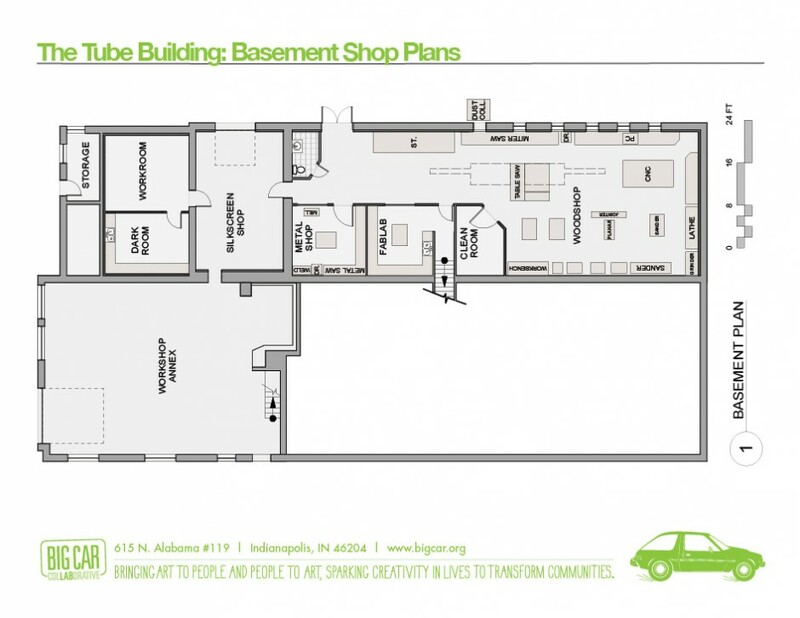 Tube Factory artspace will be offering a 2-hour Shop Safety Training workshops and open hours on Saturdays. With the workshop, you will be shown where the first aid and safety equipment are, rules of the shop, and taught basic tool usage, both woodworking and metalworking through quick educational shop exercises. Major upgrades were added to our low-power FM radio station 99.1 WQRT. 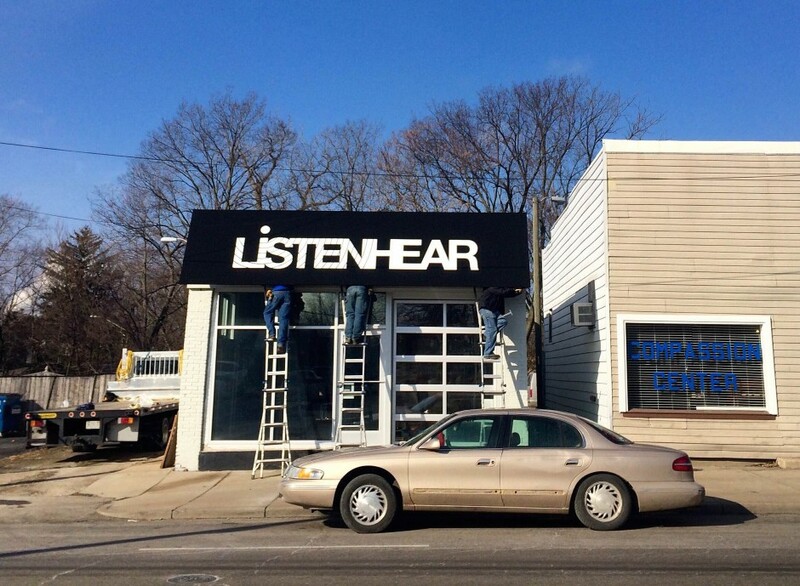 Housed in Listen Hear on Shelby Street, the WQRT website integrated new live streaming feature for your listening pleasure. The community and greater Indianapolis area can now access the station from anywhere, anytime. WQRT continues to offer a vast number of new community-generated radio programming. You can read about the community content along with the regular programming from our website. 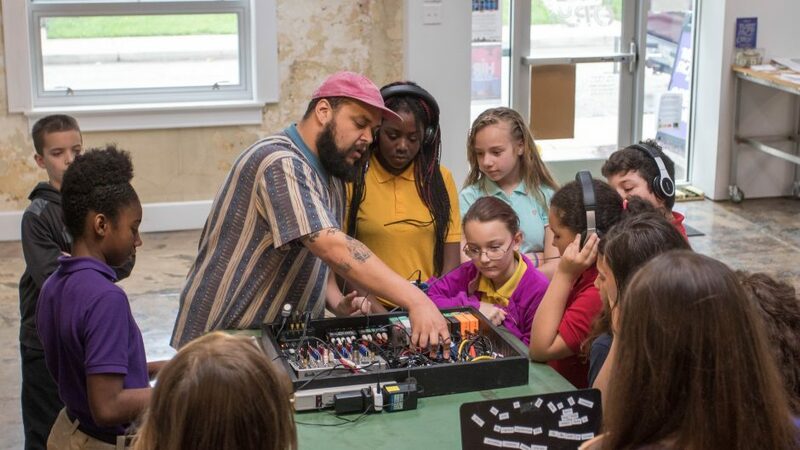 Anyone interested in becoming a DJ or a part of the WQRT LP Indianapolis community can now attend a radio DJ workshop – offered bimonthly by resident sound artist, Sean “Oreo” Jones. The artist house at 1135 Cruft saw major upgrades to its interior and exterior. The home next door to Tube Factory officially titled the Guichelaar Gallery and Artists Residency House, had big improvements including new siding, roof, dormers, gallery walls, interior refinishing and painting, remodeled bathroom, accessible ramp and door, new porch, and a 8’ x 8’ light box art installation by artist David Schalliol. You can see before and after photos of the artist house here. The community food garden in the green space grew a total of eighty-six plants in 2018! Mostly tomatoes, lettuce, corn, and a variety of herbs, these plants could be picked for their fresh organic food anytime by visitors of the space. More 2018 improvements of the greenspace include a new pizza oven and two chicken coops with a flock of 11 new chickens. The chicken homes were built in a style of geometrical domes painted in light blue and salmon pink pastel colors. In-between the coops and public garden is Indianapolis’ first Indianapolis Bee Sanctuary. A public art and socially-engaging sculpture by St. Louis artist Juan William Chávez and local collaborators Bee Public and Teen Works. You can see a video and read more about the project here. Our successful Sunny Side Up Patronicity campaign secured the project funding for the Chicken Chapel of Love and various additional projects. Big Car greatly appreciates the individual contributors, community partners, and the Indiana Housing and Community Development Authority (IHCDA) through the CreatINg Places challenge in matching the campaign contributions. Helping to make a vibrant cultural gathering space next to the Tube Factory artspace, the Chicken Chapel of Love will be fun, educational, and inviting. You can read more about the Chicken Chapel of Love from its 2018 news coverage at the IndyStar, NUVO, and IUPUI Art and Humanities Institute. 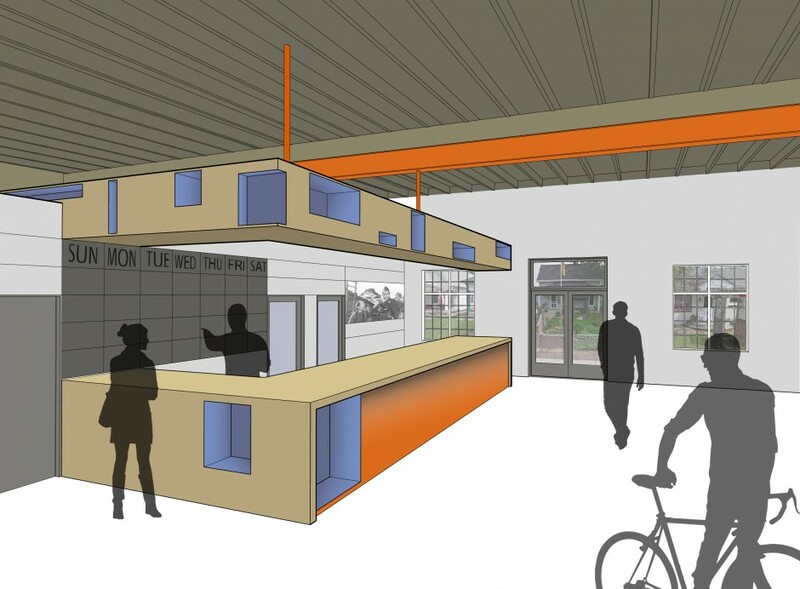 Also, as part of the campaign, we will build a social kitchen and a serving space in our community gathering area where we will host free public programs about food, nutrition, urban ecology, and agriculture. 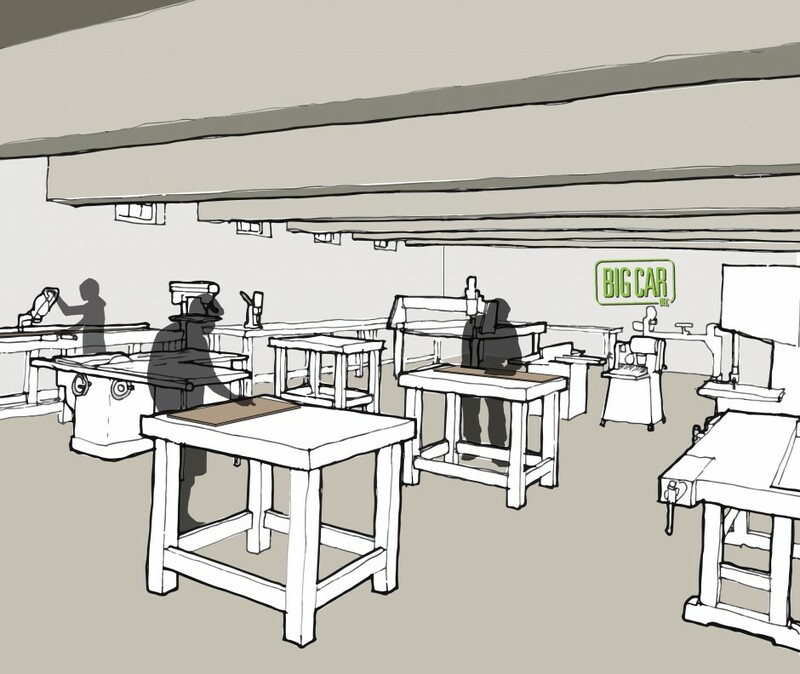 Also check out this Youtube video of Big Car co-founder Shauta Marsh, explaining the project and introducing you to our new community chickens! And see more of the chickens at our project photo page here. Finally, At the end of 2018 Big Car Collaborative along with partners, Bean Creek Neighborhood Association, Central Indiana Community Foundation, Garfield Park Neighborhood Association, Indiana University, Indianapolis Neighborhood Housing Partnership, Learning Tree, and Riley Area Development Corporation received a generous $3 million improvements grant from the Lilly Endowment through its Strengthening Indianapolis Through Arts and Cultural Innovation initiative. An initiative which seeks to bolster arts and culture and focus its impacts on the greater Indianapolis region. You can read the press release from the IndyStar here. With the support of the Lilly Endowment grant and with the resolution of details with our partnership with Riley Area Development, we will see renovation work finished on five houses that will be sold at affordable prices to artists and five more renovated as affordable rentals houses for artists and neighborhood leaders. 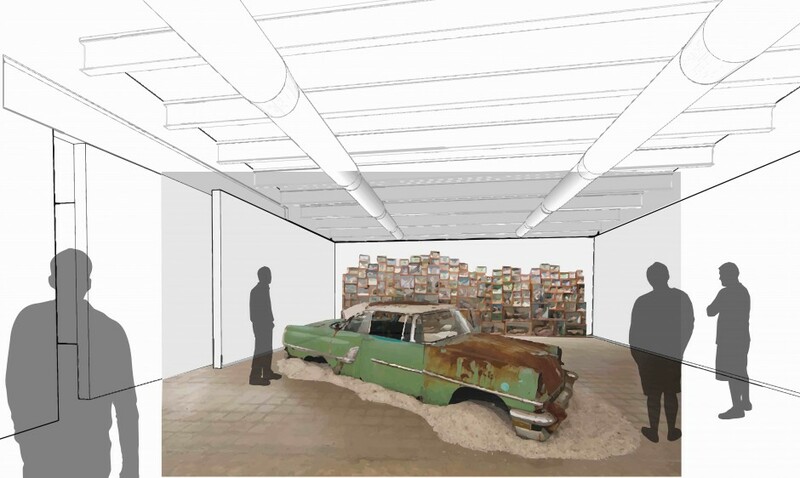 Two other buildings — our current residency house/Guichelaar Gallery next to Tube Factory and a small former church on Cruft Street — will serve as program spaces, with the house serving as a gallery and hosting short- and longer-term artists in residence.